Welcome to World Poetry Canada International Peace and Human Rights Exhibition! Welcome to World Poetry Canada International Peace and Human Rights Exhibition February 3-March 30th, Irving K. Barber Learning Centre, University of British Columbia, Canada. This exhibition features a blend of photography, poetry, and films. 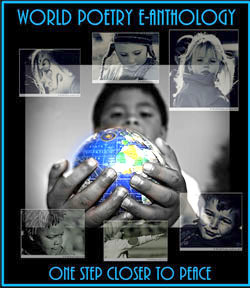 World Poetry began in 1997. Its goal was to give recognition and support to multicultural and multilingual poets and writers and those in artistic disciplines. This entry was posted in General on January 15, 2016 by Ariadne. Gaza is a garden full of roses. No garden of Eden here. in the garden of Gaza. A wonderful poem! Thank you so much! Can I put it with the display poems? Love Poems To The World Book Launch!